Xenia’s Desmond Diggs (top) hangs on as Carroll wrestler Bryan Quiroz fights to keep from being pinned, in the second period of Friday’s Feb. 1 132-pound match. Diggs won by technical fall, 17-2. Carroll’s Trenton Randall pulls Taylor Maxwell’s arm back behind him in the 152-pound match, during Friday’s Feb. 1 high school wrestling dual. Randall pinned Maxwell for a first-round win. Ethan Fisher, of Carroll (facing) opened the night’s matches with a second-round pin of Xenia’s Evan Brown at 120 pounds. 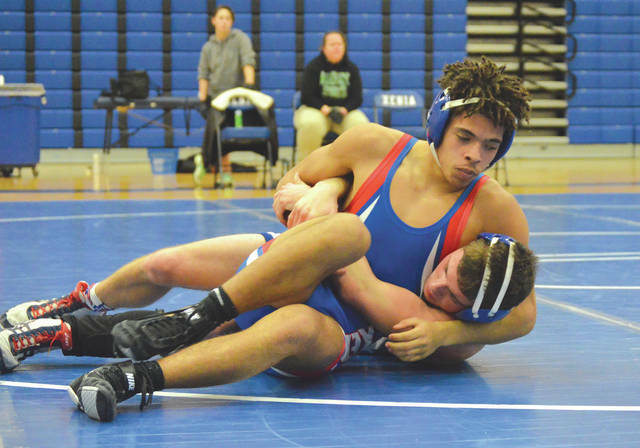 Carroll won Friday’s Feb. 1 dual match by a score of 46-21 at Xenia High School. Xenia’s Phillip Nared claimed a 15-8 decision over Carroll’s Matthew Grieshop, in the 145-pound match Feb. 1 at Xenia High School. 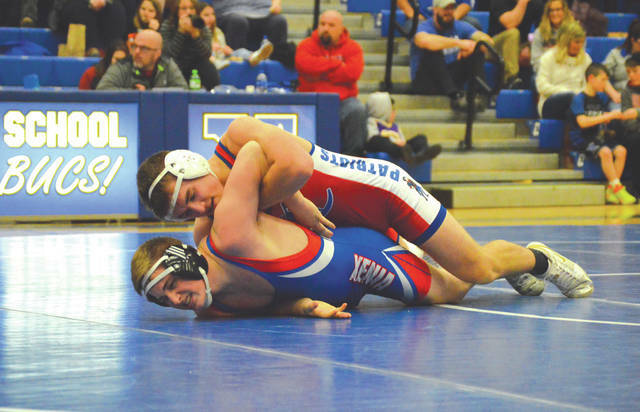 XENIA — Just hours away from their respective OHSAA dual team regional tournament matches on Saturday, Feb. 2, Greene County area schools Carroll and Xenia wrestled each other on Feb. 1. Both coaches looked at Friday’s non-league dual match as a good measuring stick to compare themselves against similar competition. On this night Carroll came away with a 46-21 team win, but both coaches were encouraged with their wrestlers’ performances. Carroll began the dual match on a four-match roll. Ethan Fisher pinned Xenia’s Evan Brown in the second round of their 152-pound match. Carroll’s Trenton Randall then earned a pin over Xenia’s Taylor Maxwell at 160. The Patriots’ Tyler Moore then pinned the Bucs’ Andrew Smith in the 170-pound match. At 182 pounds, Carroll’s Brian Zink earned a 9-0 decision over Xenia’s Gabe Wilson. Xenia finally notched a team score when 195-pounder Jacob Strickle took a 6-2 decision over the Pats’ Patrick Keller. 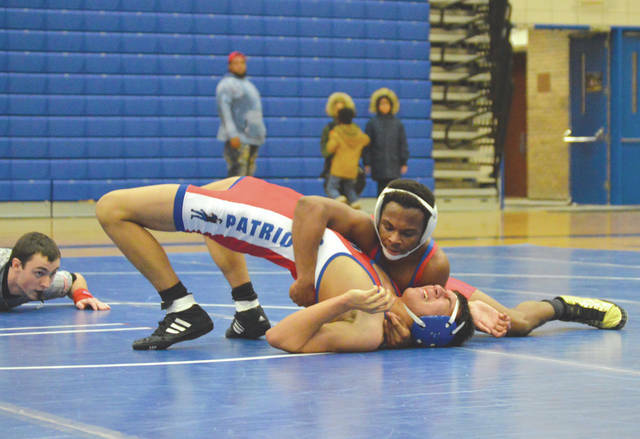 Carroll’s 220-pounder, Jamen Hill then added another Patriots pin, this one on Xenia’s Cory Davis, then Xenia heavyweight Peyton Bartley earned a forfeit win for the Bucs. At 120, Xenia’s Madix O’Bryant earned a 6-2 decision over Nick Romano. At 126, Carroll’s Henry Zink claimed a first-round pin over Xenia’s Korissa Vanover. Then Xenia closed things out with solid match wins by Desmond Diggs (at 132 by technical fall over Bryan Quiroz) and 138-pounder Phillip Nared (by 15-8 decision over the Patriots’ Joe Lansangan). 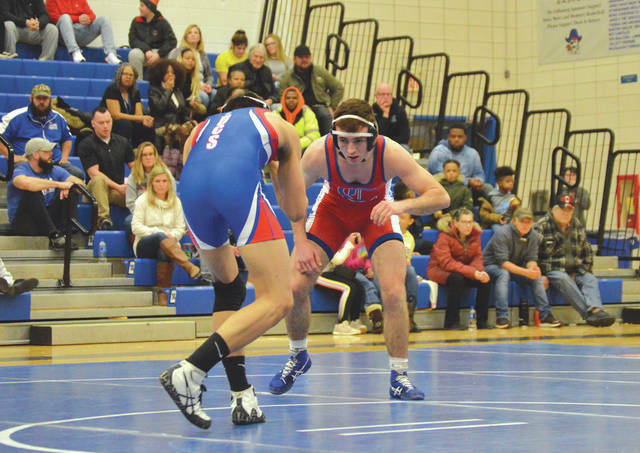 Both Carroll and Xenia are competing in their respective regional brackets on Saturday, Feb. 2 in the Ohio High School Athletic Association Dual Team Wrestling Tournament. Division-II Carroll is the No. 6 seed in the 16-team Regional 15 tourney at Ross High School in Hamilton; Xenia makes a shorter trip to the west for the Division I Region 7 tournament, which includes host Beavercreek. The Buccaneers are the 15th seed out of 18 teams. They have a first-round duel meet with 18th seed Milford, then the winner takes on No. 2-seed Springboro. Prior to the high school matches, Xenia recognized the team’s four seniors — Vanover, Wilson, Stickle and Bartley — with a small celebration. “They’re a great group. They always try to have fun when they are here, and they provide some good leadership as well. … I’ve enjoyed watching each of them grow through the years,” Schooley said.